Howard was born in Cliftonville, Kent, England the son of Mabel Grey (Wallace) and Arthur John Howard-Smith. Although Howard later claimed to have been born in 1916- the year quoted by most reference sources- he was born in 1913 (this is supported by school and other records). His father was an insurance underwriter for Lloyd's of London, serving as representative in Colombo, Sri Lanka and elsewhere; Trevor spent the first eight years of his life travelling around the world. He was educated at Clifton College(to which he left in his will a substantial legacy for a drama scholarship) and at the Royal Academy of Dramatic Art (RADA). In 1933, at the end of his first year, he was chosen as best actor in his class for his performance as Benedict in a school production of Much Ado About Nothing. While Howard was still studying, he made his professional debut at the Gate Theatre in Revolt in a Reformatory (1934). When he left school he worked regularly on stage, including in Sheridan's The Rivals, several performances at Stratford-upon-Avon, and in a two-year run in the original production of French Without Tears. Although stories of his courageous wartime service in the British Army's Royal Corps of Signals earned him much respect among fellow actors and fans alike, files held in the Public Record Office reveal that he had actually been discharged from the British Army in 1943 for mental instability and having a "psychopathic personality". The story, which surfaced in Terence Pettigrew's biography of the actor, published by Peter Owen in 2001, was initially denied by Howard's widow, actress Helen Cherry. Later, confronted with official records, she told The Daily Telegraph (24 June 2001) that Howard's mother had claimed he was a holder of the Military Cross. She added her husband "had nothing to be ashamed of" with an honourable military record. After a theatrical role in The Recruiting Officer (1943), Howard began working in films with an uncredited part The Way Ahead (1944), directed by Carol Reed. He was in a big stage hit, A Soldier for Christmas (1944) and a production of Eugene O'Neill's Anna Christie (1944). Howard received his first credit for The Way to the Stars (1945), playing a pilot. Howard's performance in The Way Ahead came to the attention of David Lean, who was looking for someone to play the role of Alec in Brief Encounter (1945). Lean recommended him to Noël Coward, who agreed with the suggestion, and the success of the film launched Howard's film career. Howard was reunited with Lean for The Passionate Friends (1949), but the film was not a success. However, The Third Man (1949), which Howard starred in alongside Orson Welles and Joseph Cotten for Carol Reed from a story by Graham Greene, was a huge international success, and became the film of which Howard was most proud. During filming in Vienna, Howard was keen to get to his favourite bar for a drink as soon as filming had finished for the evening. On one occasion Howard was in too much of a hurry to change out of his uniform as a British Army major. After a few drinks, he got into an argument and attracted the attention of a real major, who ordered the Military Police to arrest Howard as an impostor. Howard was forced to apologise and was summoned to appear before the British commanding general, Sir Alexander Galloway. Howard was reunited with Carol Reed for Outcast of the Islands (1952) and he made a war film, Gift Horse (1952). That year he made his final appearance in Britain's ten most popular actors, coming in at number nine. He was in another adaptation of a Graham Greene story, The Heart of the Matter (1953). Greene also wrote and produced Howard's next film, the British-Italian The Stranger's Hand (1954). Howard was in a French movie, The Lovers of Lisbon (1955), then supported Jose Ferrer in a war film from Warwick Pictures, The Cockleshell Heroes (1955), which was popular in Britain. Howard's first Hollywood film was Run for the Sun (1956), where he played a villain to Richard Widmark's hero. He made a cameo in Around the World in 80 Days (1956) and again played a villain to an American star, Victor Mature, in Warwick's Interpol (1957). Howard starred in Manuela (1957) then supported William Holden in Carol Reed's The Key (1958), for which he received the Best Actor award from the British Academy of Film and Television Arts. When William Holden dropped out of the lead of The Roots of Heaven (1958), Howard stepped in - the star part in a Hollywood film (although top billing went to Errol Flynn). After a thriller Moment of Danger (1960) he was in Sons and Lovers (1960), for which he was nominated for an Academy Award for Best Actor. He was nominated for a BAFTA on four other occasions. and received two other Emmy nominations, one as a lead and the other as a supporting actor. He also received three Golden Globe Award nominations. Howard was reunited with Holden for The Lion (1962). He was Captain Bligh to Marlon Brando's Fletcher Christian in Mutiny on the Bounty (1962). He was in a TV movie production of Hedda Gabbler (1962) and played the title prime minister in "The Invincible Mr Disraeli" (1963), an episode of the Hallmark Hall of Fame for which he won an Emmy award for his role then supported Robert Mitchum in Man in the Middle (1964) and Cary Grant in Father Goose (1964). After a cameo in Operation Crossbow (1965), Howard supported Frank Sinatra in Von Ryan's Express (1965), Brando and Yul Brynner in Morituri (1965), and Rod Taylor in The Liquidator (1965). After a leading role in The Poppy Is Also a Flower (1966) he made two movies with Brynner, Triple Cross (1966) and The Long Duel (1967). Howard had a change of pace supporting Hayley Mills in Pretty Polly (1968). He went back to military roles: The Charge of the Light Brigade (1968), as Lord Cardigan, and Battle of Britain (1969). He had support parts in Lola (1969) and Ryan's Daughter (1970), the latter for David Lean. He made a Swedish film The Night Visitor (1971) then settled into a career as a character actor: To Catch a Spy (1971), supporting Kirk Douglas; Mary, Queen of Scots (1971), as Sir William Cecil; Kidnapped (1971); Pope Joan (1972); Ludwig (1972); The Offence (1972), with Sean Connery; A Doll's House (1973), for Joseph Losey; Who? (1974), supporting Elliott Gould; and Catholics (1974) for British TV. He appeared in some horror films - Craze (1974), Persecution (1974) - and the more prestigious 11 Harrowhouse (1974), in which his wife Helen Cherry starred with him. In The Count of Monte Cristo (1975), he mentored Richard Chamberlain. He played military men in Hennessy (1975) and Conduct Unbecoming (1975). Around this time he complained that he had to work so hard because of the high rate of tax in Britain. Howard could be found in Albino (1976), shot in Rhodesia; The Bawdy Adventures of Tom Jones (1976); Aces High (1976); Eliza Fraser (1976), shot in Australia; The Last Remake of Beau Geste (1977); and Stevie (1978). He was one of many names in Superman (1978), Hurricane (1979), Meteor (1979) and The Sea Wolves (1980). He appeared in a TV series Shillingbury Tales (1980–81). One of his strangest films, and one he took great delight in, was Vivian Stanshall's Sir Henry at Rawlinson End (1980), in which he played the title role. He and Celia Johnson from Brief Encounter were reunited in Staying On (1980) for British TV. The Dawning (1988) was his final film. Howard recorded two Shakespeare performances, the first, recorded in the 1960s, was as Petruchio opposite Margaret Leighton's Kate in Caedmon Records' complete recording of The Taming of the Shrew; the second was in the title role of King Lear for the BBC World Service in 1986. He married Helen Cherry. He died on 7 January 1988 from hepatic failure and cirrhosis of the liver in Arkley, Barnet, aged 74. ^ "Howard, Trevor [real name Trevor Wallace Howard-Smith] (1913–1988), actor". Oxford Dictionary of National Biography. Retrieved 4 March 2019. ^ "World news Howard: the epitome of British stoicism". The Canberra Times. 62, (19, 088). Australian Capital Territory, Australia. 9 January 1988. p. 4. Retrieved 1 September 2017 – via National Library of Australia. ^ "Popular star Trevor Howard hides behind beard". The Australian Women's Weekly. 14 (13). 7 September 1946. p. 36. Retrieved 1 September 2017 – via National Library of Australia. ^ "BFI Screenonline: Howard, Trevor (1916-1988) Biography". www.screenonline.org.uk. ^ "Trevor Howard - Theatricalia". theatricalia.com. ^ Arditti, Michael (10 July 2016). "Theatre reviews: French Without Tears and No Villain". ^ "Trevor Howard details". The Guardian. 3 March 2008. ^ "Production of The Recruiting Officer - Theatricalia". theatricalia.com. ^ "Brief Encounter (1945) - Articles - TCM.com". Turner Classic Movies. ^ Staff, Variety (15 December 2001). 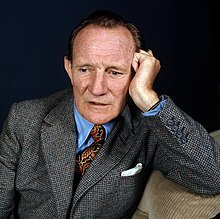 "Trevor Howard: A Personal Biography". ^ "Actor's safety clause". The Sun (2461). New South Wales, Australia. 18 June 1950. p. 46. Retrieved 1 September 2017 – via National Library of Australia. ^ "Hope tops list for popularity". The Mail. Adelaide. 30 December 1950. p. 5 Supplement: Sunday Magazine. Retrieved 19 April 2014 – via National Library of Australia. ^ "COMEDIAN TOPS FILM POLL". The Sunday Herald. Sydney. 28 December 1952. p. 4. Retrieved 27 April 2012 – via National Library of Australia. ^ "The Cockleshell Heroes (1956) - Articles - TCM.com". Turner Classic Movies. ^ "Ibsens "HEDDA GABLER"". The Australian Women's Weekly. 30 (19). 10 October 1962. p. 4 (Television). Retrieved 1 September 2017 – via National Library of Australia. ^ "AUSTRALIAN FILM FOR THE ACTOR WITH "THE LIVED-IN FACE"?". The Australian Women's Weekly. 42 (52). 28 May 1975. p. 15. Retrieved 1 September 2017 – via National Library of Australia. ^ "Million-dollar movie planned". The Canberra Times. 50, (14, 311). 26 February 1976. p. 16. Retrieved 1 September 2017 – via National Library of Australia. ^ "The Passionate Lives of Trevor Howard". Ottawa Citizen. 17 February 1961. ^ "No Sir! Stars who refused honors". CNN. 21 December 2003. Retrieved 21 September 2009.